In our need to escape the daily routine chaos, serenity acts as a cure and even stands for inspiration for the environment-friendly clothing apparels like a royal heritage known to be “Pashmina”. Cherished for centuries and beyond, this royal beauty has always been the limelight for fashionistas. 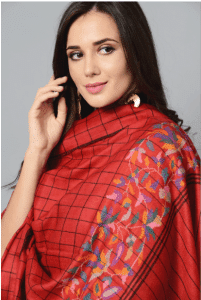 Be it the mighty emperors from ages ago to fashion mavens of today, pashmina has been reckoned all across the globe for its luxury it has to offer. The impeccable voyage of Pashmina wool begins from lofty Himalayan Mountains and winds up in exquisite valleys of Kashmir. The transformation of pure wool into wearable luxury is nothing less than magic. ‘Iekwat,’ a sublime word that represents the essence of togetherness in Kashmiri language, quintessentially summarises us. The label has become much more than a timeless Indian Couture. It represents cultural heritage by its handmade luxury products of Pashmina which is adorned and admired all across the globe. The label is identified for redefining luxury as cruelty-free, empowering craftsmanship and harmonizing traditional wear seamlessly for your styling. A beautiful and promising venture that preserves promotes and flourishes the traditional heritage of the Kashmir valley, Iekwat sources 100% genuine Kashmir Pashmina merchandise directly from the local Kashmiri artisans. ​Offering a selective “Valentine collection” of vivid handmade Pashmina shawls and stoles, we’ve conglomerated an exquisite selection of genuine finest Cashmere for the modern day as well as classic sensibilities and tastes. Come and witness the love this Valentine, for the royal Pashminas. Get your orders at Iekwat.